The option to take additional paternity leave has not been taken up by as many fathers as was hoped, but few employers make this option affordable for male staff. How can organisations get ahead on this and stand out as an employer of choice? Most British employers would like to think they are family-friendly, with many offering above and beyond the statutory requirements when it comes to paid maternity leave. When additional paternity leave (APL) came into effect in April 2011, giving working fathers the right to apply for 26 additional weeks’ paternity leave, many employers baulked at the cost and fathers simply felt that they could not afford to take it. APL and additional statutory paternity pay, which came into effect on 3 April 2011 under the Work and Families Act 2006, gave all working fathers or partners whose baby is due on or after 3 April 2011 the right to apply for an additional 26 weeks’ paternity leave. APL cannot begin until the baby is 20 weeks old and depends on the mother returning to work within her maternity leave period, with at least two weeks of statutory maternity pay untaken. The maximum amount of statutory payments per family is capped at 39 weeks. A government consultation to further overhaul parental leave includes proposals to reclassify the existing entitlement to a further 34 weeks’ maternity leave as “flexible parental leave”, which will be available to either parent on an equal basis, and reallocate the existing entitlement to a further 21 weeks’ maternity pay as “shared parental pay”. Proposals announced by the Government last year to further overhaul parental leave policies – by enabling parents to share leave to a certain extent – have highlighted the inequalities between what is offered to new mothers and new fathers. Many European countries already offer substantial leave periods to fathers as well as mothers, and some also offer the option to share the leave period or take some of it together. In Iceland, for example, paternity leave rights are absolutely equal to those of the mother, while in Sweden parents are entitled to a total of 480 days’ paid leave per child, with both mothers and fathers entitled and encouraged to share the leave. Research from BT and the Employers Network for Equality and Inclusion (ENEI) has found that almost half of fathers now do either a majority or an equal share of childcare, yet two-thirds (67%) do not believe that their employer supports this with sufficiently family-friendly policies. Also, with many employers only offering the statutory two weeks’ leave, for which they are not even obliged to offer full pay, a huge number of families cannot afford for the father to take a substantial amount of time off. In fact, a report last year by the Department for Work and Pensions found that 40% of new fathers failed to take up paternity leave because they couldn’t afford to. It also pays to view your overall benefits package – from including family on your group income protection policies to enhancing maternity and paternity pay – as a means of engaging staff and making it more financially attractive to spend time with their family. Wilmott continues: “Go beyond ticking the box and offer something of value. If you know it’s going to be welcome to all staff, play around with the qualifying criteria to make it more affordable; perhaps enhance paternity after two years’ service as a way of rewarding loyalty and boosting engagement,” he says. “Where people are more satisfied with their work/life balance we see a greater discretionary effort,” he adds. “Start at the top with progressive chief executives, who are not afraid to use these benefits themselves. Men feel that it’s not culturally acceptable to take paternity leave under a ‘command and control’ leadership, but its provision forms an important part of becoming a high performing organisation.” At Ikea, for example, a previous managing director took six weeks off when his wife had a baby, by combining his paternity leave with holiday. “That shows that it’s OK for the MD to be out of the business for six weeks to focus on his family, and that he trusts people around him to run the business while he spends time with his family,” says Cathy Donnelly, UK and Ireland HR director at the retailer. If you need to build a business case for enhanced paternity leave, consider using data from exit interviews to find out whether or not staff want more flexibility. Also look at absence levels – in some cases, staff may be taking time off for family commitments that they feel they don’t have the flexibility to cope with within their existing rights. One reason to consider enhancing parental benefits for fathers is the question of fairness, particularly if you already offer enhanced maternity pay to mothers. According to the charity Working Families, two out of three employers offering APL plan to pay fathers only the statutory paternity pay (£128.73 per week) or 90% of the employee’s average weekly earnings (whichever is lower) during the extended period, even though 65% of these offer enhanced maternity pay for the equivalent weeks that a female is on maternity leave. 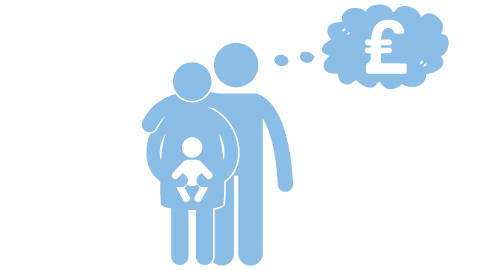 Almost 20% of employers surveyed by the charity last year plan to pay fathers six weeks at full pay when they take APL. The Government’s guidance is that they do not need to, but thankfully employers are increasingly taking on board how it must feel to be a male employee getting the statutory minimum when they look across the desk and see a woman getting full pay for six months. Larger organisations are, in general, more likely to provide family-friendly policies because they have greater financial resources. Around 44% of larger employers provide more than the legal minimum paternity pay, compared with 9% of small employers according to the CIPD. Santander offers full pay to employees on paternity leave, explains Claire Osborn, HR policy manager: “We also aim to offer our staff maximum flexibility to use other types of leave in conjunction with paternity, with options such as discretionary special leave, holiday and compressed days working, able to be combined with paternity leave to maximise the time they are able to spend with their new family. BT also offers two weeks’ full pay and an option to take another two weeks at half pay. The company also offers APL for 26 weeks at statutory rates beyond the fourth week. BT finds that the vast majority of new fathers take the first two weeks leave, but it is access to a full portfolio of flexible working policies, including home-based and term-time working, that enables many fathers at BT to assume the primary carer role when they start a family. Caroline Waters, director of people and policy at BT, says: “In our research with ENEI, 87% of dads said they wanted their employers to help them meet their parental responsibilities, but the majority of employers don’t seem to have got their heads around this yet. The same research shows that nearly half of all dads would change employers for more flexibility. “So many of our dads feel relieved to be ‘out’ in the workplace: able to ask for time off, not just to attend school plays and sports days, but also to enable them to contribute to these events. Modern fathers aren’t content with a tokenistic approach, and they want to take a proactive role in their children’s lives. Research from BT and the ENEI shows that many employers fall short of offering fathers the support they need. The findings reveal that while one father in two (49%) says that they do the majority or an equal share of the childcare, two-thirds (67%) don’t think their employers have sufficient family-friendly policies. 46% would consider changing their employer for greater flexibility.